Our decision to do our own thing in Lahaina on the island of Maui was perfect. 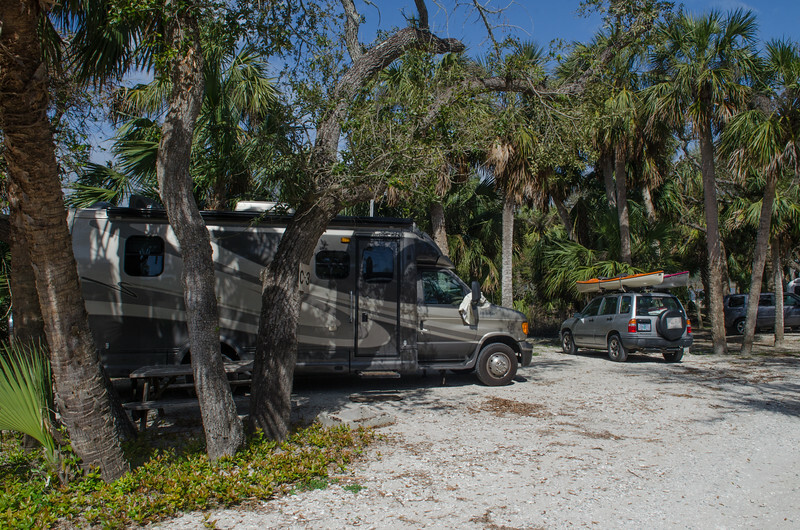 There are so many amazing things to see and do on this island, and we know that we plan to return someday for a longer visit. 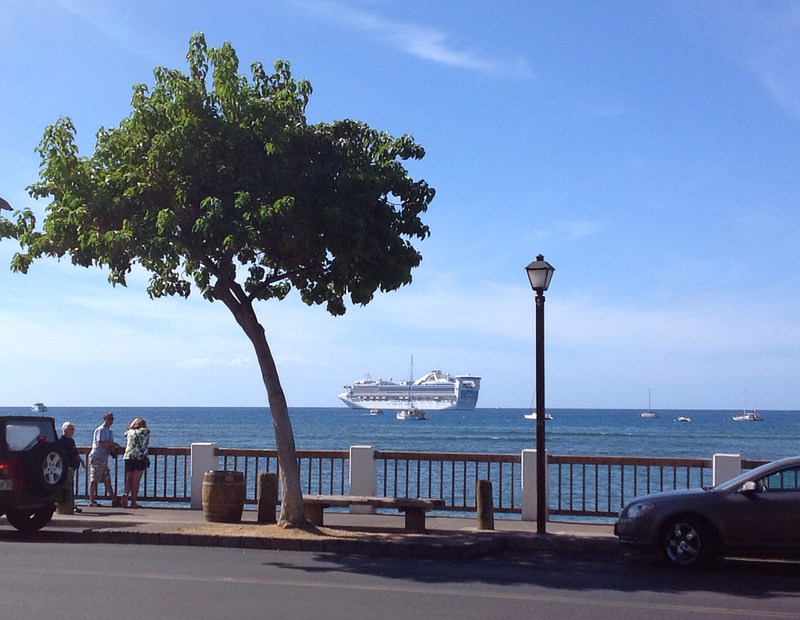 The ship tours of the island included the Road to Hana, cycling down the road that leads to the great Haleakana volcano, lots of snorkeling trips and various other adventures. We looked at Google Earth and decided that Kaanapali Beach would be a good outing. 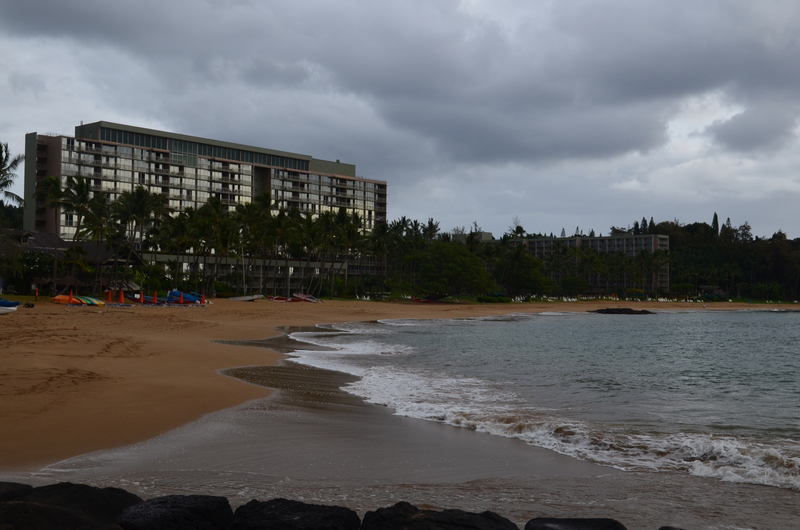 We knew that this world famous sandy beach was easily accessible by bus from the port town of Lahaina. The best laid plans are open to change, and the lovely little town of Lahaina charmed us so completely that we spent the entire time in port exploring the town, walking along Front Street, and topped it off with a couple of hours in the sun on Baby Beach, just a short walk north of town. This was our only port that required tender service, and Princess had a decent tender system. When we were ready to go, we went to the Capri dining room to get a tender ticket number, and then waited maybe ten minutes before we were called to board our tender. Even though the seas were only moderate, it still required a bit of agility to jump from the ship to the tender, and there were two nice strong young men helping folks with the timing of the leap. Once on shore, we discovered that we were right in the middle of the town, and across the street from the historical court house. The visitor center is right there, and the young woman working at the desk was incredibly helpful. She told us which beaches in town might have good snorkeling, how to use the bus system, how to get to Hilo Hattie's for the free tram, and how to get to Whalers Village and Kaanapali beach. 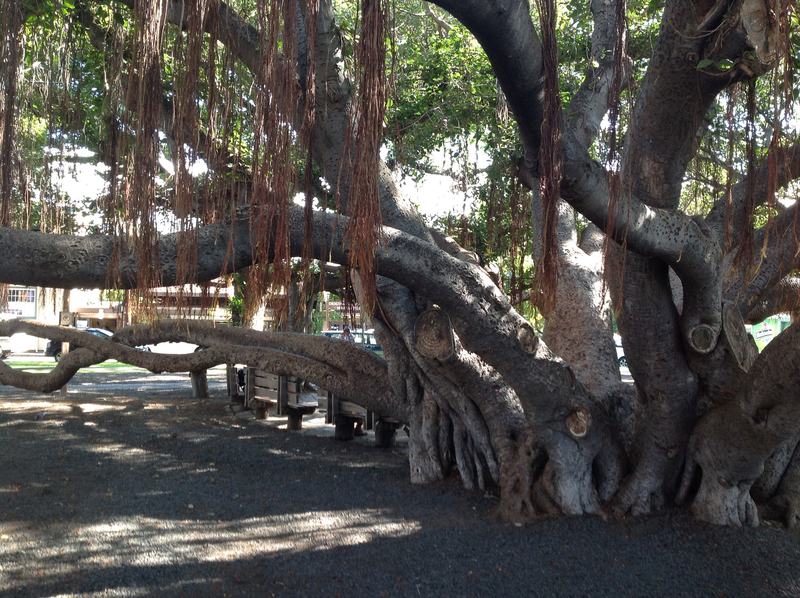 The first thing we saw right behind the court house was a lovely park with huge banyan trees. The day was warming up perfectly and the shade was wonderful. I lived in Hawaii on Oahu from 1950 to 1952 and my favorite memory of living on the islands as a child was the banyan tree where I climbed and played to my heart's content. We took our time walking through the town toward the beach, and after seeing how beautiful it was, we decided that staying right where we were was the very best option. 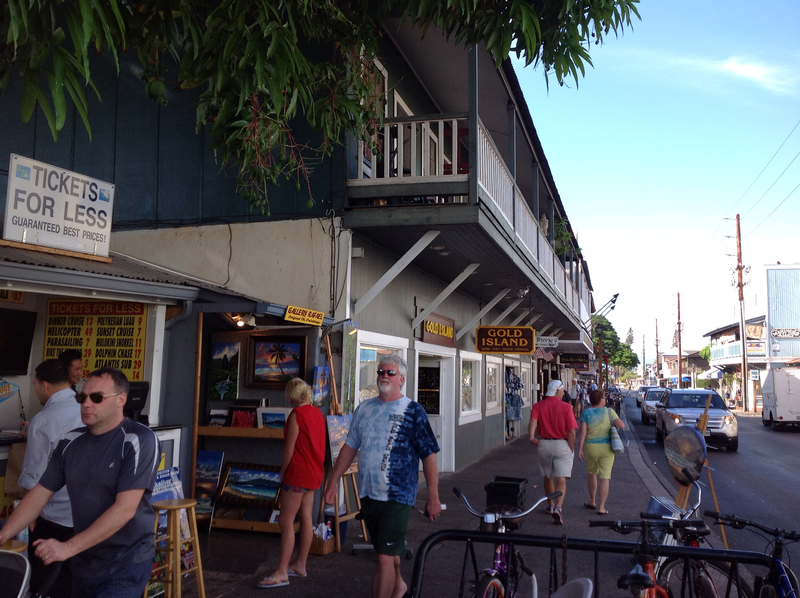 The town of Lahaina itself is wonderful. Of course, it is very touristy, but in a way that is delightful. There were lots of interesting shops with beautiful clothes, and dozens of galleries with all kinds of amazing art. We even found a good place for shave ice, my favorite Hawaiian treat. Shave ice is incredibly fine textured and flavored with wonderful fruit syrups. It is nothing like a snow cone, even though it might look like one. The path to the beach at the north end of town goes in between houses in a residential area, and we almost missed it until a nice woman sitting in her front yard motioned us back to the path. We saw lots of babies and young children and thought maybe it was called Baby Beach because it was shallow and gentle, with no waves at all. The island in the distance is Lanai, and we could also see Molokai to the north. We walked to the far northern end and found a perfect spot for our beach towels. We were dressed in swim suits under our sundresses, with water shoes and our snorkel gear. The bags were a bit heavy but we had no plans to return to the ship during the day, so had to carry it all with us. I chose to leave the big camera behind, but did pack along the iPad so I could at least take a few photos. The water felt cold at first, but once we were in it was fine. There was very little wind, and we snorkeled from the beach with shallow canyons of coral between sandy bottoms so we could stand up on sand any time we needed to rest. Our reward was Hawaiian Trigger fish and some lovely yellow and white butterfly fish. There weren't a lot of them, but I would imagine if we had gone farther out on the reef we would have found more. 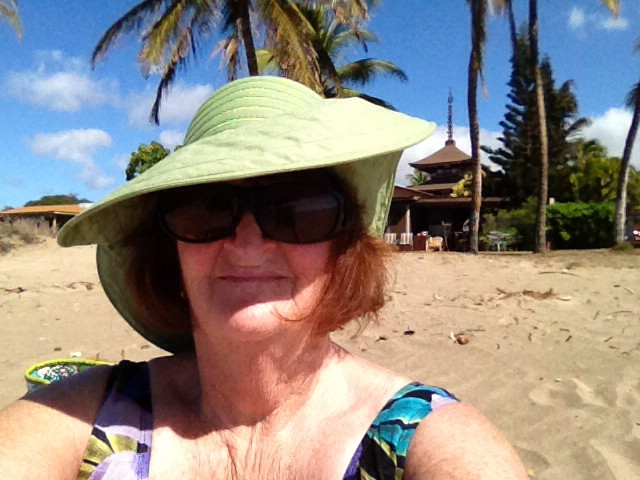 After a couple hours on the beach we decided it might be prudent to get out of the hot tropical sun. We were both ready for a cold beer, and within a few blocks of the beach we found Bubba Gumps. The restaurant is one of my favorites and the open air atmosphere was perfect. 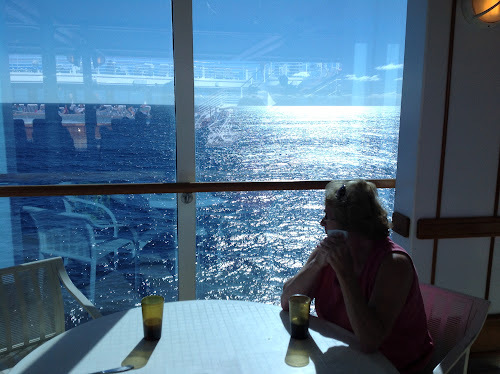 We settled in to a booth with a view of the water and our ship in the distance and had beer and an appetizer of fries for Mo and fabulous coconut shrimp for me. I tried a Kona amber ale that was a bit hoppy but settled in really well after the first few sips. We learned that Whaler's Village is a very high end shopping center, with all the fashion name stores that Melody and I saw last month in Vienna. No need to do that on this trip. Also, we could see the famous beach in the distance, and could also see all the high rise hotels on that beach. The laid back vibe of Lahaina town was much more to our liking. I had always imagined Maui to be more like the hi rise beach, and was delightfully surprised to find this old town so lovely. It of reminded both of us of Key West, which we love. 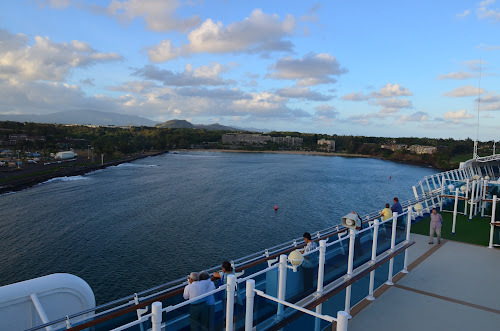 We decided that when we come back to the islands, we will plan on spending at least a week on Maui. We will then drive the famous narrow, crooked road to Hana and go to the top of the Haleakana volcano. I had no idea that I would like Maui as much as I did. Sail away was at five and we were on board in plenty of time to relax and clean up before dinner. Our towels, swimsuits, shoes, and everything else we had with us was covered in fine, sticky sand. We dressed for dinner and were treated to another great meal. I had prime rib that was excellent, with a mushroom tartlet and a perfect green salad. Mo had a pork chop with a fig demiglace and a caesar salad. I tried the cheesecake for dessert and Mo once again had "nothing" . Our waitperson Elena decided it was time to actually give her nothing, and surprisingly above the "nothing" word was a delightful fresh strawberry sweet thing. 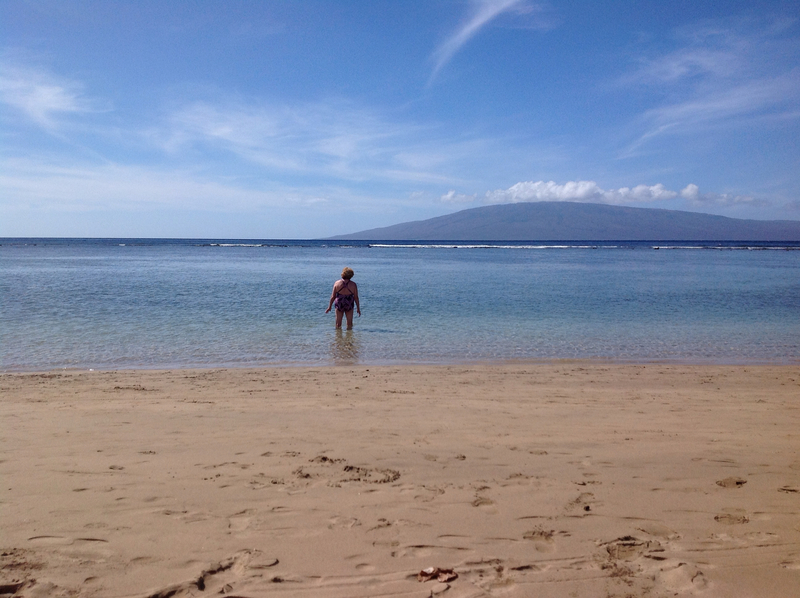 Our day on Maui was very nearly perfect. Tomorrow, Honolulu. 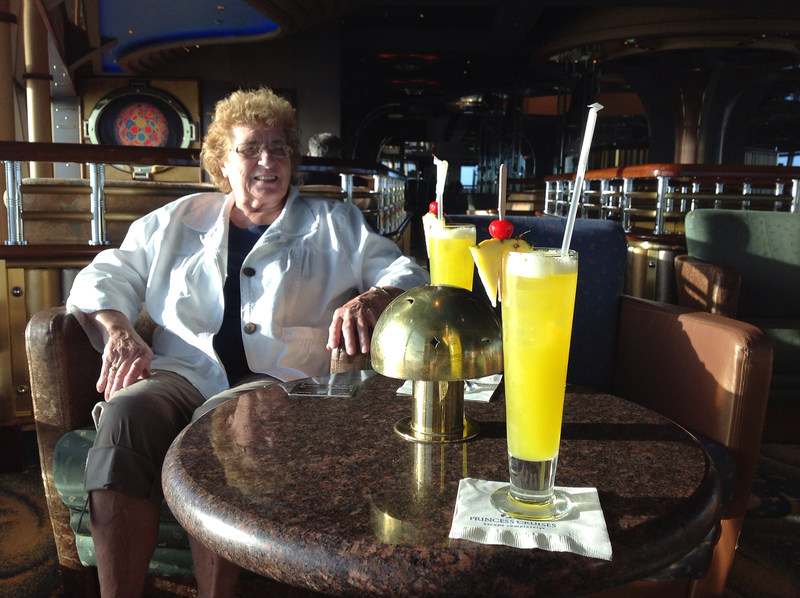 We know from past cruise experiences that a one day port stop anywhere doesn't really give any kind of a true picture of a place. This seemed especially true to us on our day in Kauai. Back in the spring of 2008, Mo and I spent 8 idyllic days on the island of Kauai. I have yet to figure out how to post a link with blogsy, so if you are interested, search the archives for "Kauai" from March 2008. 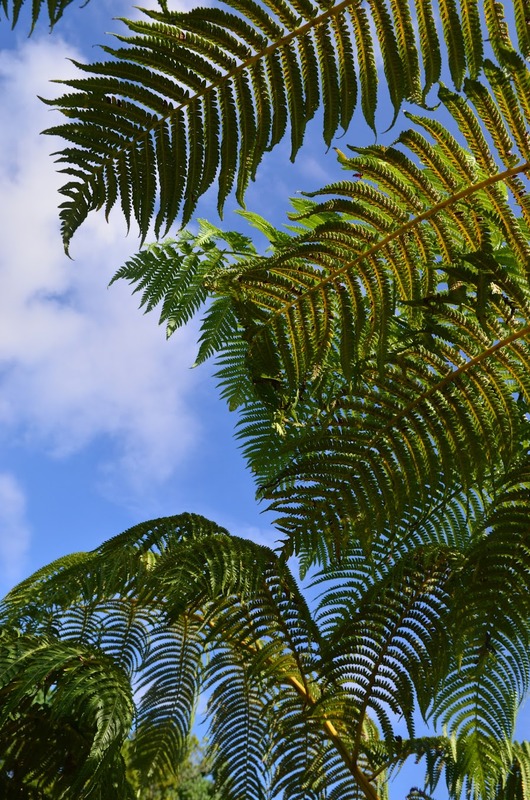 We knew from experience that the best way to see Kaui was with a rental car and decided that since we had already seen the island, we would just hang around Nawiliwili Harbor, check out the local beach nearby, and visit the town of Lihue on foot or by free shuttle. As the ship docked, the free shuttles appeared, Hilo Hattie's, Walmart, K Mart, all want your shopping dollars and are more than willing to take you to town. The walk to Nawiliwili park looked simple, and the only beach in this part of the island was just beyond the park. It was a simple little beach, but the air was still chilly and the winds were stirring up the water too much for any decent snorkeling. Instead we decided to walk up the hill the 2.5 miles to Walmart, hoping to maybe find a shave ice or something interesting along the way. The walk up the hill from the harbor wasn't too difficult except for the very narrow road, no sidewalk, and heavy traffic. By the time we got to Lihue proper, we were quite happy to find sidewalks. Lihue is a real town when you reach the top of the hill. Down below near the cruise dock, the Anchor Cove shops are a little bit touristy, but up in town it is very straightforward. Car dealers, grocery stores, and the post office. Hilo Hattie's is about the only interesting place we found, but everything in there is so very expensive that we just drank our free sample of juice, took our free shell lei, and walked over to Walmart. Walmart had a great selection of Hawaiian shirts and dresses for about half the price, but the quality was about half as well. We didn't buy anything, but made good use of the Hilo Hattie shuttle to return to the ship. We had time to snorkel a bit, but the wavy beach didn't look all that inviting some settled in for some gorgeous sun time on our very own deck with some gin rummy, the card kind. 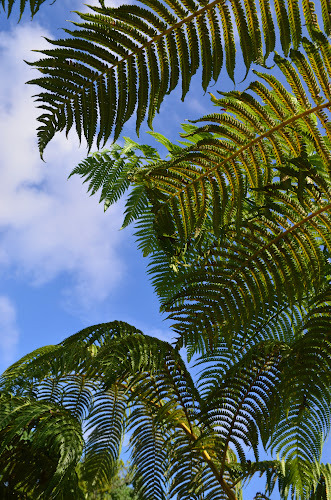 The really beautiful parts of Kauai are on the north shore near Hanalei, the broad beaches are on the south shore at Poipu and the shave ice is far away on the west side at Queen's beach. 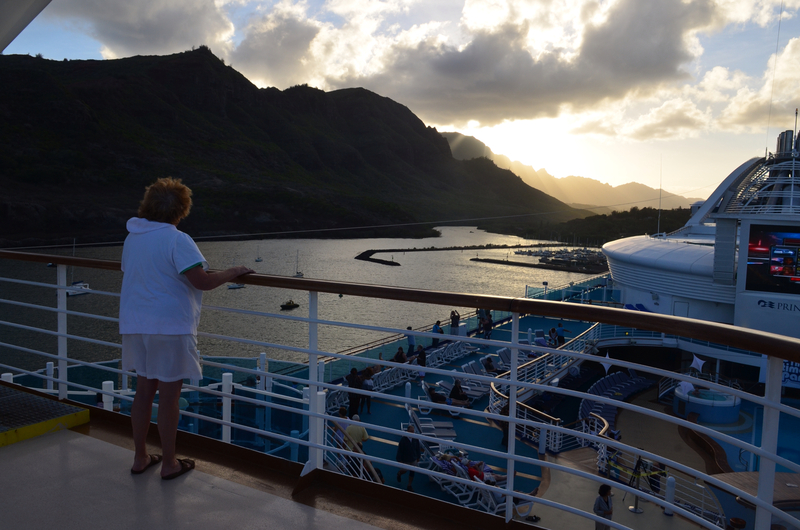 We love Kauai, but know that in just one day you can't even come close to experiencing the beauties of the island. 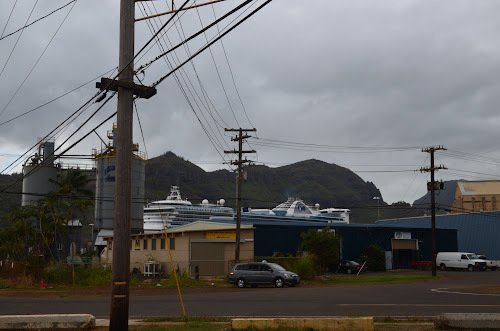 We also realized that even though we were here for more than a week, we avoided Lihue and never once drove down the hill to Nawiliwili harbor. Nawiliwili is a very small, tight harbor built long before cruise ships were so big. Up on deck for the sail away was great, with good music and plenty of entertainment watching the captain negotiating our huge ship out of the tiny harbor. We enjoyed dinner again in our dining room with orange roughy for Mo, not particularly great, but my pork roast in fig onion saute was delightful. Overall it was a pleasant day, but certainly not a memorable one. After dinner we went to a snow so forgettable that neither of us can remember what it was! Our sailing routes through the islands are interesting. We are going back and forth from one island to the other and doing a lot of backtracking, crossing our previous routes repeatedly. Tomorrow we will arrive early in Maui the only port where we will need to tender to shore. Arriving in Hilo just a bit after sunrise was lovely in spite of the cloudy skies. We ordered our stateroom breakfast early since our group tour was at 8:30. Neither of us have been to the Big Island, and we thought it might be nice to see a bit more of the island than we might manage on our own. 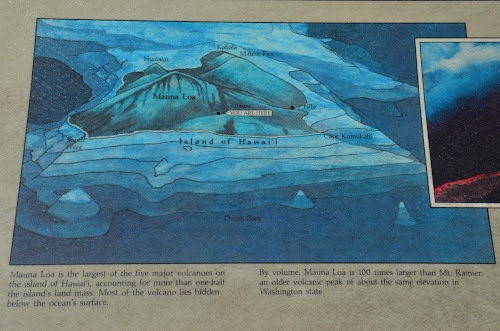 Hawaii volcanoes are tremendous, and we wanted to see them, but didn't want to take a chance not getting back to the ship in time for sailing. In retrospect, I think we might have seen more if we had decided to rent a car. The tour bus trip was nice, the driver kept up a running commentary about the history of the island, of Hilo, of the volcanoes. 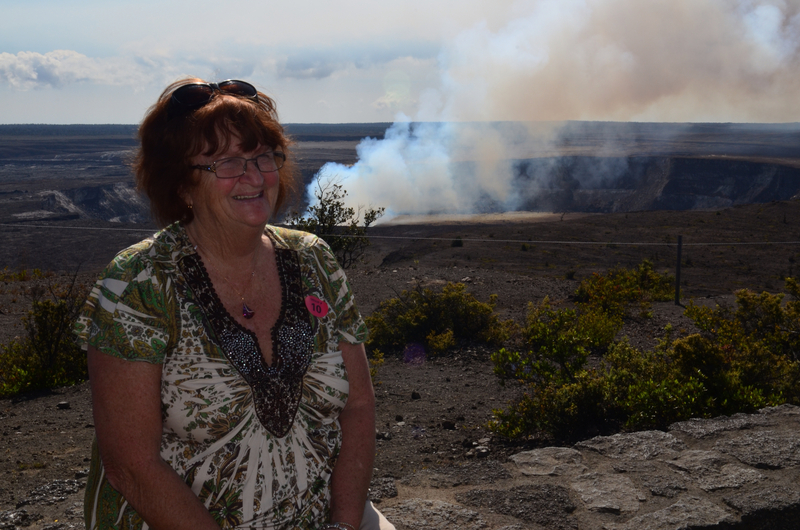 We rode about an hour before arriving at the visitor center for Hawaii Volcanoes National Park near the rim of the Kilauea caldera. The visitor center as great, and the volcano obliged nicely by popping out some sulphured steam. It has been continuously erupting for some time now, but we weren't able to get to the other side and see the actual lava flows. That was a bit of a disappointment, but none of the tours could go there because of the dangerous fumes and the danger. I am not sure if we could even get there on our own in a rental car. Somewhere along the way, I heard that it was 8 miles from the nearest road. 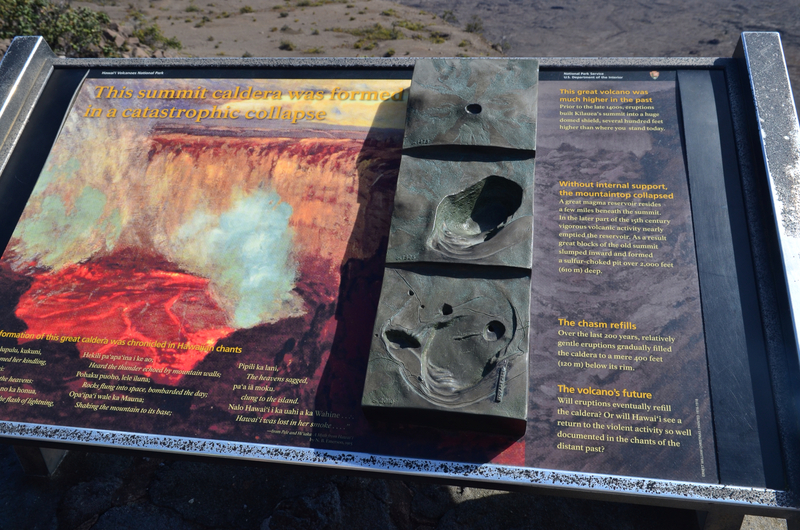 Kilauea is much smaller than the huge mass of Mauna Loa rising above more than 13,000 feet above sea level. Mauna Loa is the largest volcano on earth in sheer mass, with a rise from sea floor to summit of more than 30,000 feet. Both Kilauea and Mauna Loa are shield volcanoes, unlike the stratovolcanoes which are formed in our own Cascades by explosive eruptions. The shield volcanoes build with flow after flow of lava that build broad, gently sloping mountains. We did have enough time to walk through the Thurston Lava Tube, much like some of our own lava tubes in Oregon, but much taller, no hard hats required, but I was glad for my walking sticks. After a few days on the ship, solid ground makes me sea sick and I have to wear my wrist bands and use the sticks to keep my balance. Silly. 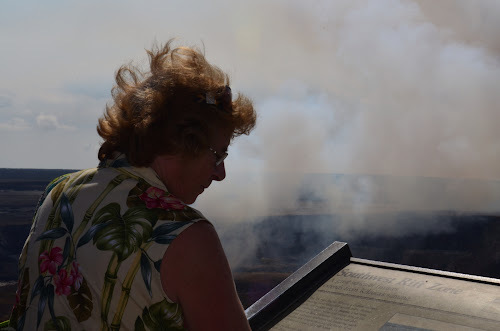 We had just under an hour or so at the visitor center, before we continued a few short miles to the Jagger Museum, also on the rim of Kilauea. 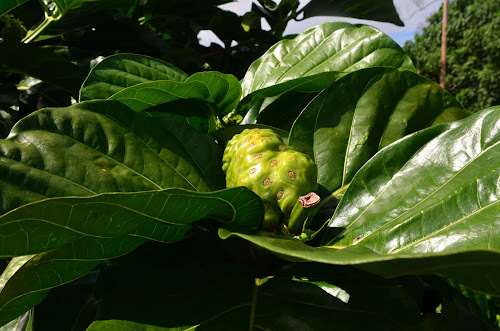 Half an hour there and again we were back on the highway heading down the mountain toward the Macadamia Nut Farm. I guess the farm is a requirement for any tours on the island, even on weekends when the factory wasn't actually working. I would have loved more time to hike around in the park rather than go to the farm. 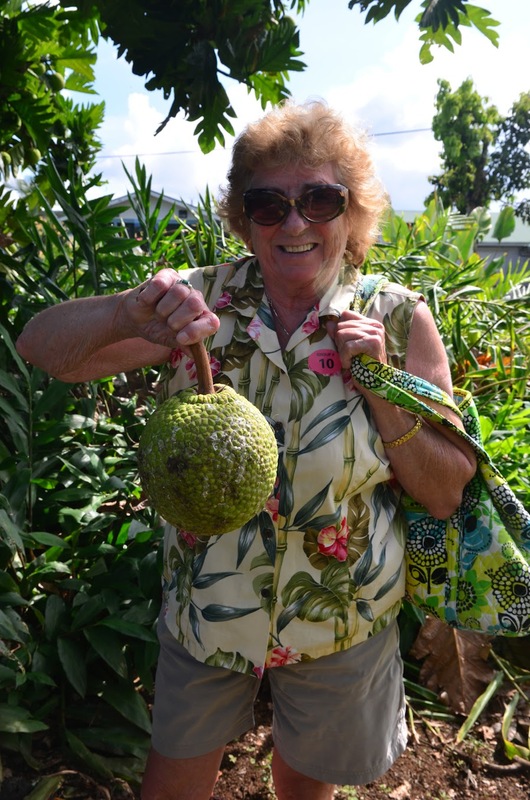 The only redeeming quality at the farm was the garden, with all sorts of tropical fruit trees with strange looking unfamiliar fruits. Neither one of us gets all excited about macadamias, but we did take time for a rather incredible scoop of macadamia chocolate ice cream. The weather was gorgeous by afternoon in spite of the morning overcast. 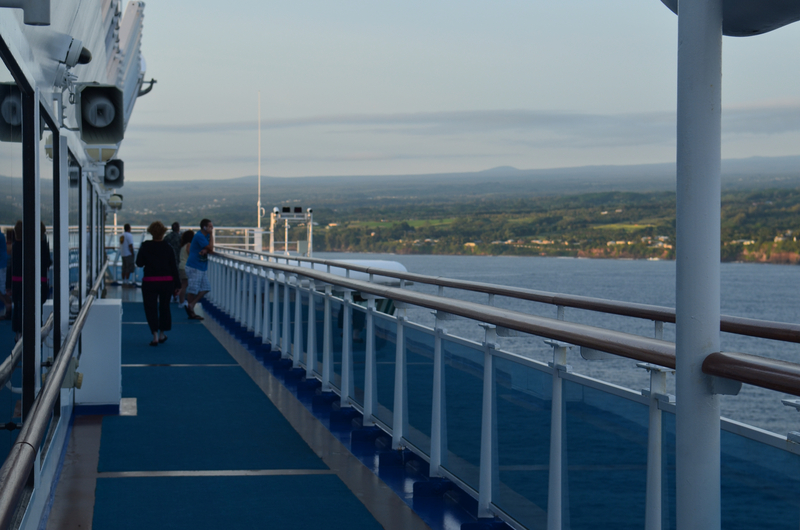 We never actually saw much of Hilo. 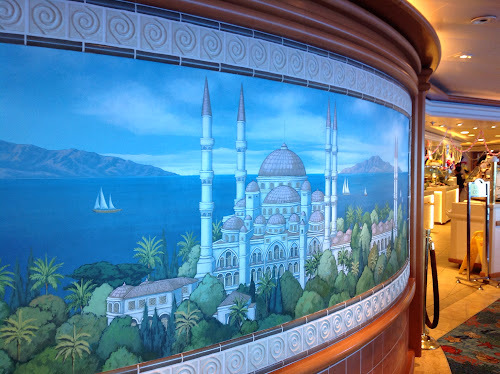 I could see it on the map, and could see it in the distance from our stateroom, but finding transportation that late in the afternoon with a 4:30 sailing time seemed too much to mess with. Later I talked to some folks who did go into town, only to discover after their expensive taxi ride that there wasn't much there, and what was there was closed on Sunday. The cruise port is in a very industrialized part of Hilo, and there didn't seem to be any of the little cruise shops around that are such a familiar sight in so many ports. The other thing that we saw was a lot of rough, black lava rock instead of beaches. I can see why most snorkeling adventures on the Big Island are from a boat, there just aren't that many beaches. We watched the sail away from our balcony, and felt the ship speed up. 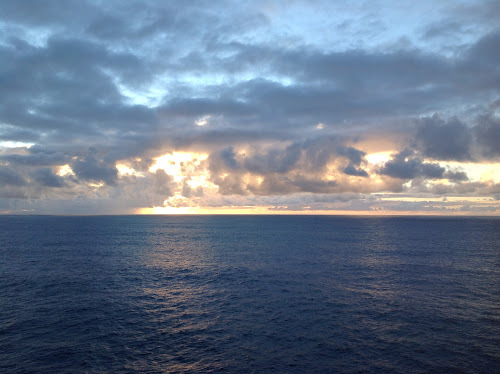 According to the captain, we had to sail at the ship's maximum of 22 knots in order to cover the 230 miles or so from Hilo to Nahwilliwilli Bay on Kauai. 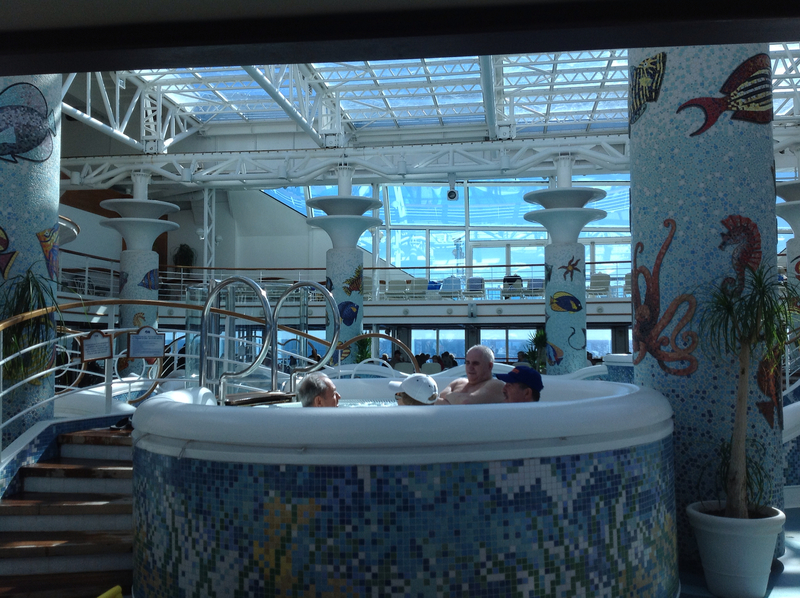 We napped until dinner time, after all, it IS a cruise and that means lots of relaxation. The only problem for us is trying to get all psyched up for dinner at 7:45. I think it is worth it, though, because there are fewer people for the late seating and we have time to visit with our waiter, Elena, who is from Romania. 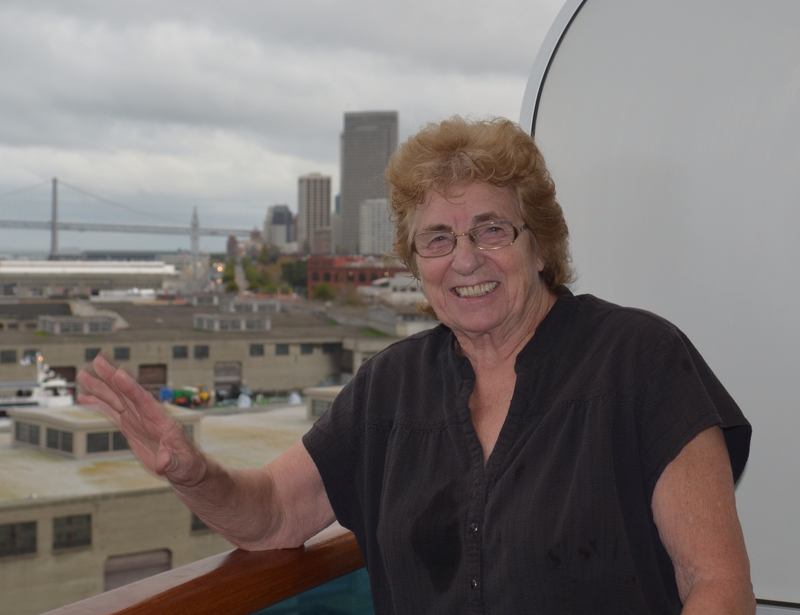 She is a lot more fun to talk to than some tablemates in our cruising history. Our dinner was beautiful, Mo's favorite so far, with two versions of chicken, Mo's in a simple roasted thyme butter and mine in a magnificent Alaskan Beer onion sauté, with caesar salads to begin, and some kind of apple pie in the form of spring rolls and a raspberry dipping sauce. The only down side was my soup, supposed to be a corn chowder with sweet potato that tasted exactly like something that came out of a Gerber baby food jar. Blech!! 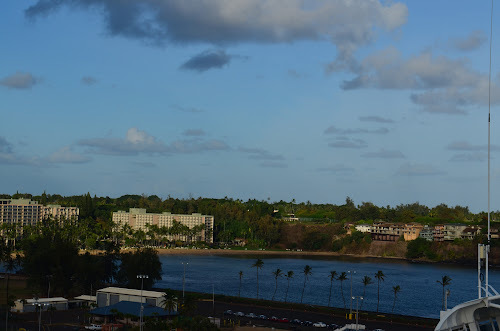 None of the entertainers seemed like they were worth the trouble, and we just wandered through the ship back to our room to settle in with our books and a good night's sleep to get ready for our day on Kauai. Even with the promise to myself to write every day, another sea day just slipped by me without a single word typed into my journal. 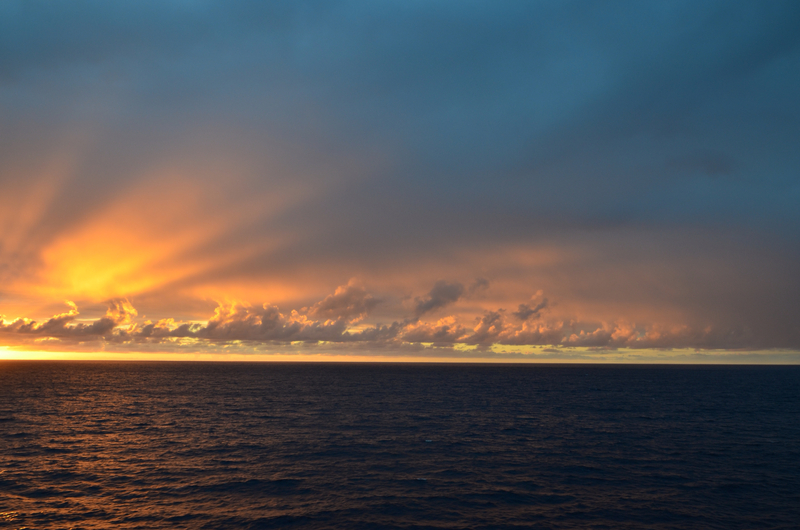 Still, after another sunrise at sea, the rest of the day was basically a repeat of the previous one. The sun came out a bit more and we actually managed some deck time reading in the afternoon. We ate, we did the treadmill, I met with the knitting ladies and before you could blink it was time for the evening entertainment. We spent quite a bit of time on the verandah playing gin, and I even saw flying fish. The first cruise Mo and I took together was an inside cabin on Holland America. We moved to rooms with a window, but now I think we are spoiled. 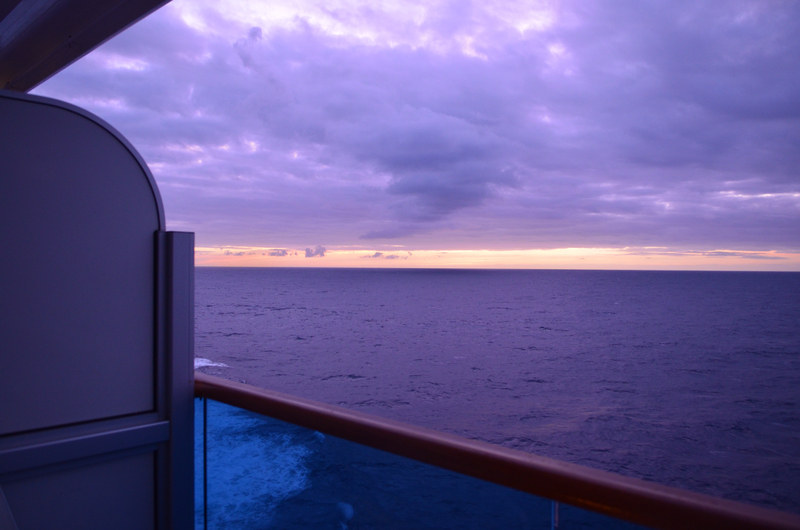 I would rather do fewer cruises than settle for a room without the pleasure of fresh air. Speaking of fresh air, Princess has now banned all smoking in the staterooms, even on your deck, so no more stale cigarette stuff drifting our way as we sit outside in the sun. We ambled downstairs for the outlet sale, but the pickings were pretty thin. Who really needs one more satin evening purse, even if it is only ten bucks. Princess is scheduling more performances so that if you miss a show, you can catch it later. The trade off, of course, is that the shows are fairly short, only 45 minutes at best. We skipped the first production show, but managed to see another one last night. Not spectacular, but entertaining at least. Once again we returned to our late seating dinner in the Amalfi dinig room for a lovely dinner. We both had orange roughy in a red curry sauce, with fresh veggies and we finished our bottle of dry Riesling purchased on a previous night and saved for us by our waiter. As I said, "Rinse and Repeat" . Nothing much new to report for this last sea day before we reach our first port in Hilo tomorrow morning. For the time being, I feel completely disconnected from anything resembling real life. 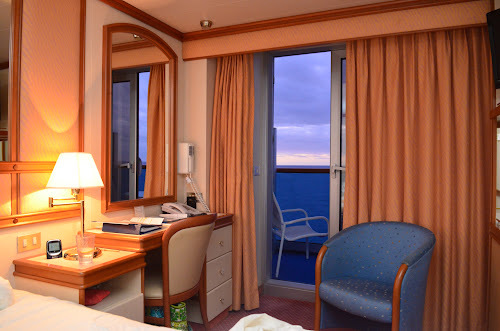 I think we do so well in the stateroom because we are so used to the MoHo, which is considerably smaller. 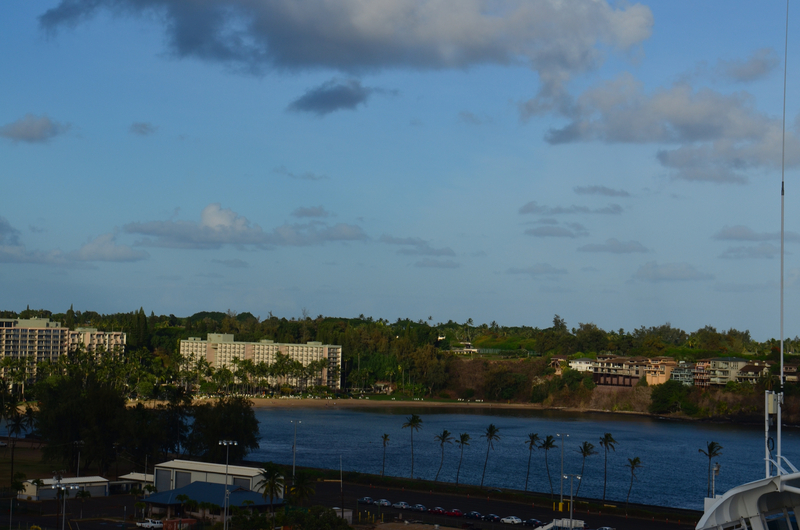 Stay tuned for our port day on the big island of Hawaii. Our huge floating town hold 2600 passengers and 1100 crew members, a ratio of one crew for every two passengers. So far the service has been wonderful. 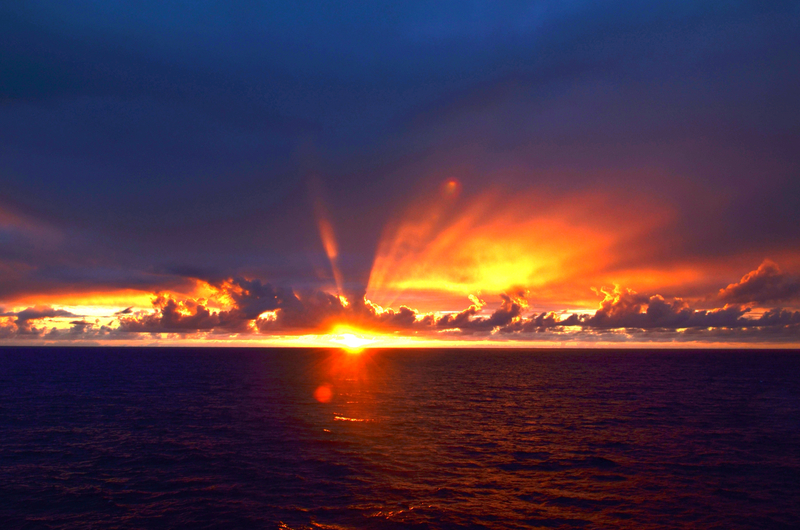 It is all contained, a huge hunk of brilliantly lit survival in the middle of the ocean. In the midst of this huge blue space lie the Hawaiian Islands. Two more nights and another day at sea before we land in Hilo. With our late dinner seating we have to go to the latest shows, and the production show, Stardust, didn't start until ten fifteen. I am truly surprised at how almost everyone on this ship seems to be in the mood to dress. I saw some really lovely dresses floating around. Formal night between dinner and the show is always a nice time to play in the casino, and we both did our usual visit with the penny slots. We like the casino, but neither of us are particularly big gamblers. I used to love black jack, but I am too cheap to plop down five bucks per bet for that one. I couldn't remember how to play craps if I tried, although Maryruth and I had a home version that we enjoyed several decades past. Still the slots were decent to me and I came away with my twenty bucks intact and then some. The show was entertaining, not spectacular, with most music from an era even before mine. It was definitely geared to the older cruise set. Mo and I are slipping more gently into the sea day routine. Waking after 7 AM just in time for sunrise, and coffee delivered to us on our deck by eight is a far cry from our home routine. At ten I went down to the Crooner's Lounge to meet again with the knitting women to share patterns, yarns, stitches, and creativity. The rest of the day was marked only by the occasional event marked off on our Princess Patter sheet. 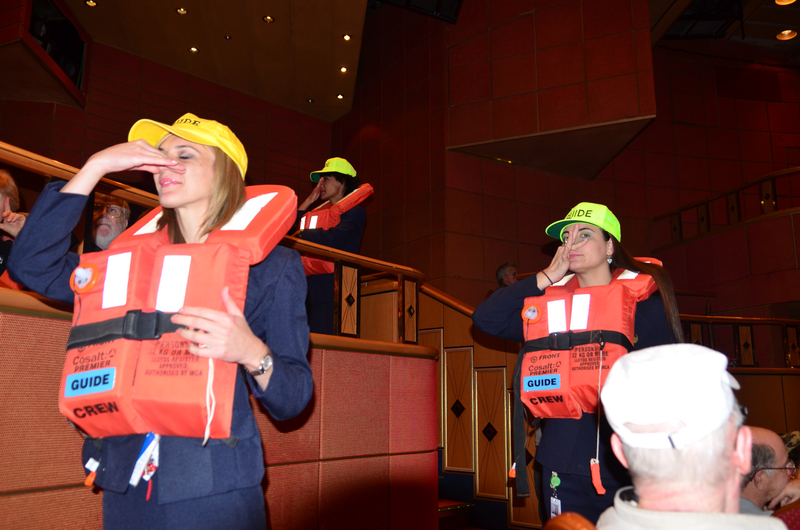 An at sea fashion show in the Piazza? The show was cute, with cruisers modeling stuff that was sold in the boutiqueson board. 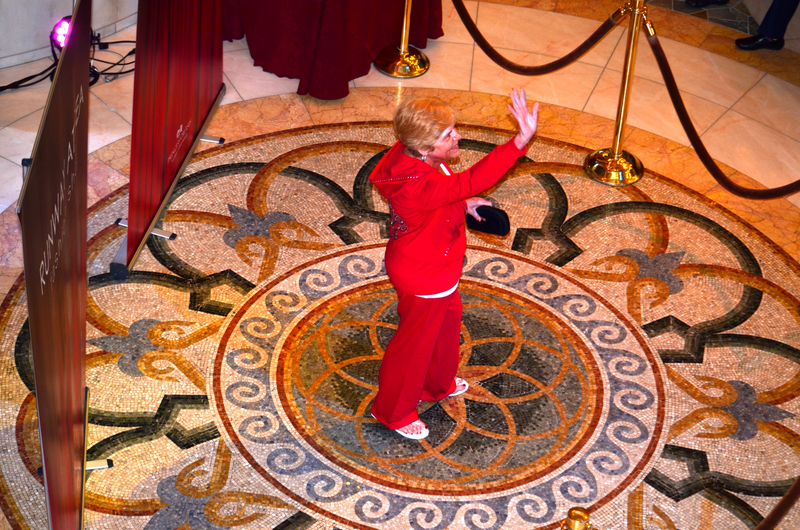 The old men with bellies got the most cheers except for a spiffy lady in red, who had recently lost 101 pounds. Folks really cheered for her. More reading and more knitting in the comfy chairs in the Crooner's Lounge, this time with Mo. A special British Pub lunch in the beautiful Crowne Grill, where we were seated with two women from California who weren't very happy with the trip. The one lady said, "I just am not enjoying THAT!" as she pointed to the rolling ocean. 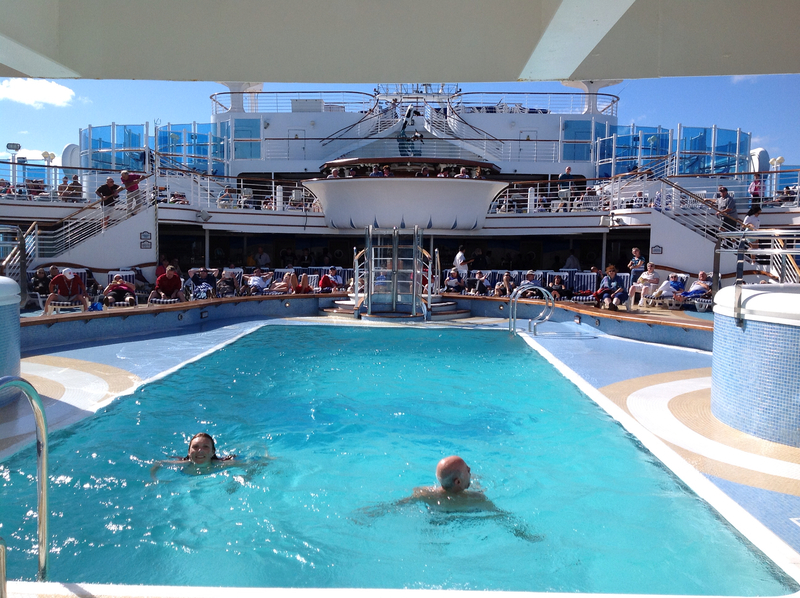 Hmmm, did you think a cruise with ten sea days wasn't going to have ocean? The lunch had several British items on the menu, including steak and kidney pie, but Mo and I were both quite happy to have fish and chips and a good Bass ale to wash it down. Our treadmill workouts are really fun, with views out over the bridge as we try to get the heart rates up for half an hour or so. Burns a whole 150 calories, I hear, but still feels really good. So far the decks have been too cool and windy to be really conducive to walking outside. Maybe tomorrow, although no matter how much we walk the decks, I still want to keep using the treadmills. During the lull time in the afternoon we regrouped a bit in the stateroom before wandering out to see what in the world "elevator roulette" might be. A large group of people gathered at the aft elevators to bet on which door would open first. Sorry, crew, but that was major stupid! We laughed and left to go play in the casino before dinner. Tonight, since we had enjoyed such a great lunch we opted for an early light supper in the Horizon Court. Our plan was to the go to the 7 PM show, but the venues had a ventriloquist in the theater and a magician in the big Vista lounge. Our stateroom seemed much more inviting to is. I carried a plate of cookies and some more of that yummy pumpkin stuff to our room and we ordered after simmer coffee from room service. All is quiet now except the sound of waves breaking against the ship. I am finishing up a Patricia Cornwell mystery very impatiently, since I have Barbara Kingsolver's newest novel "Flight Behavior" waiting on my Kindle. it takes discipline to keep reading and not jump right I to a book by one of my most favorite authors. Time to read, time to knit, time to do nothing, time to think about what a blessing it is to have time unfettered by all that "stuff" of everyday life. Tomorrow promises warmer temperatures and hopefully a bit less wind. I am definitely ready to have some pool time! Also, since a couple of people have mentioned it in comments, nope, we forgot to take photos in the fancy duds. There are two more formal nights, so I'll try to remember then. Thanks for following along and taking the time to comment! Woke to a beautiful, if a bit subdued sunrise this morning. Our coffee and yogurt were delivered at 8 and we sat out on the veranda to enjoy the fresh morning air. It is already 68 degreesF and the clouds on the horizon are not anywhere close. The swells are only five feet this morning and the patch is doing its job. The irritating side effects of the patch are nothing compared to that horrid throwing up kind of sea sickness. Mo is attending the the most demanding job of the day: read the Princess Patter and make a little list of what we want to do when. Last night we went to a great short show with a truly good vocalist, Lovena Fox. She had a great range and was a good entertainer. I actually got goosebumps when she sang "Don't Cry For Me Argentina". Jennifer Lopez always used the "goosies" to judge whether a singer was good enough to win on American Idol. I really love it when music gives me goosies. I think I even got a few watching Paul McCartny on the big screen the other night as we sailed under the bridge. 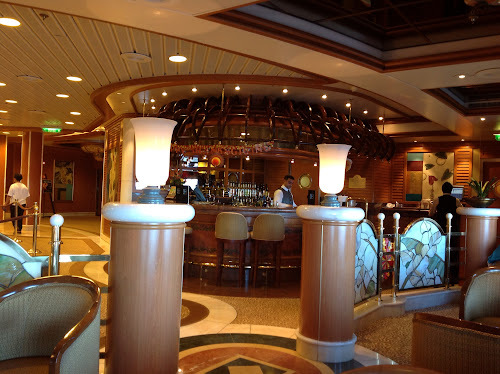 After the show we traveled through the Promenade deck 7 to the Amalfi dining room for our second seating dinner. Everything was actually delicious! We weren't too excited about dining on our last cruise to New England on the Caribbean Princess, so dinner was a great surprise. I had spicy beef satays and a Tom Thai soup for appetizers, and then decided on the signature Princess fettuccini Alfredo, thinking it might be easy on my stomach. It was, and I even enjoyed a perfectly made creme brûlée for dessert. Mo had a Caesar salad and some excellent beef fajitas with all the trimmings, including some great guacamole. The meat was well seasoned, tender, and perfectly cooked. After dinner coffee was prompt, hot, and strong. Much, much different than our last cruise. Tonight we will be eating turkey in the dining room so we are happy to discover that the food there is good. The weather today has been nice, and the clouds on the horizon never came near us and thank goodness the swells have stayed low. Even without pool time, it is amazing how we can while away a day. At ten I decided to join a group of "Knitters and Natters", an informal gathering with no leader, for some light conversation and some ooohing and ahhhhing about what everyone was working on. It was nice. Mo watched a show on how to carve a turkey, which was a bit of a turkey anyway. We wandered to the pool deck to see how warm the hot tubs were, and snce they weren't that warm, we decided instead to sit on the sunny side of the deck and people watch. I knitted, Mo read, and we shared a really good hot dog and some french fries from the Trident burger bar near the pool. We hoped to play some ping pong, but the tables were completely monopolized so we gave up. It was 2PM, and the agenda had nothing of importance until 4. 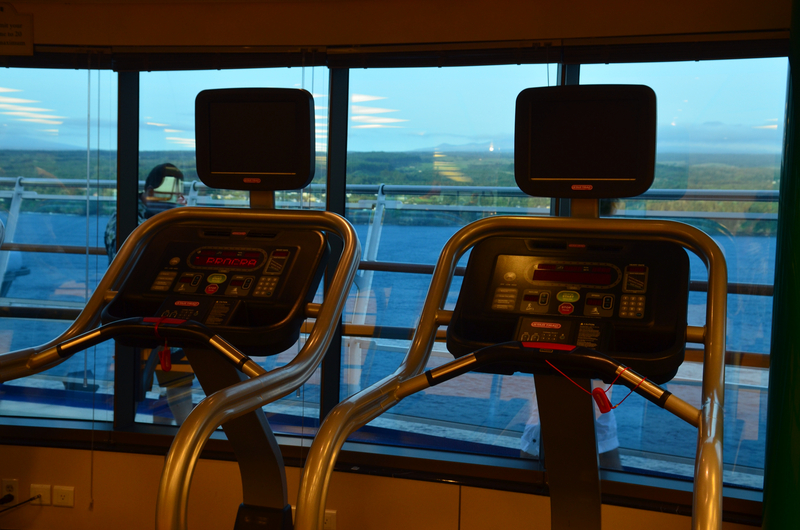 We went back to the stateroom to put on workout clothes and then up to the 15th floor to the fitness center. 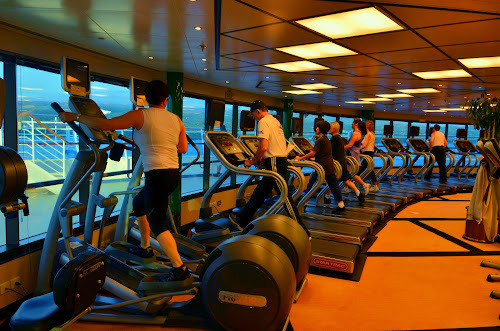 All the elliptical and treadmill machines look out over the ocean at the front of the ship. 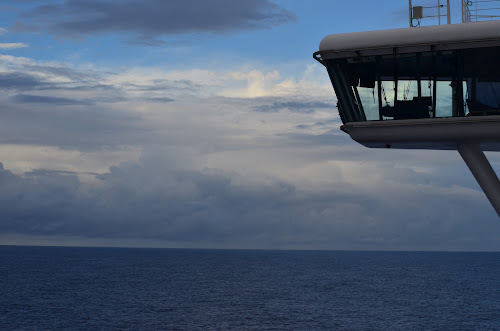 The machines are pretty high tech, and it took awhile to get them going, but once we did it was a great workout, better than walking the windy decks on the track above us or on the coldish promenade deck below us. Back to the room for another change of clothes to go to the Captain's Circle party. 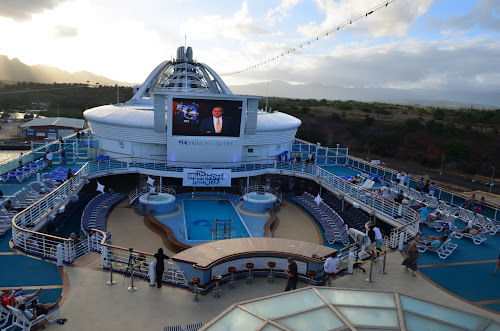 In the past this party for repeat cruisers was held in one of the big bars, with wonderful hors doeurves and complimentary cocktails while cruisers were awarded various prizes for the most cruise days, the most cruises, and some random door prizes. We even won a bottle of champagne at one of the previous parties. This one was different, not worth the effort of going down the elevator! It was a big generic group of people gathering in the big Princess theater. No drinks, no hors doeurves, and just some promotional videos of the new Royal Princess coming out next year. So their way of thanking repeat customers is to dump us into the theater and try to sell us something? That was dumb. The gift certificate from the captain for a drink of our choice that was passed out to us as we left the theater barely made the thing worth while. Another silly while the time away moment was the 12 varieties of fudge special at the Godiva chocolate shop tasting party. I stood in line for 3 little and I mean tiny little, pieces of fudge and then a hard sell to buy more. I hate gummy fudge and this was quite gummy. Nothing like the sweet, creamy perfection of Alaska fudge company in Juneau. Ah well, I kept my card in my pocket for this one. 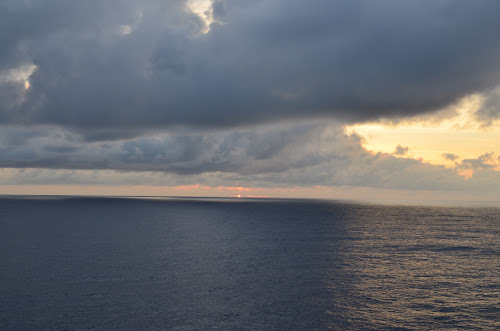 All these non-activities make it sound that cruising can be really stupid and boring, but in between the stupid stuff, there is still always the ocean. Outside our deck the sky is open, and the sea slides by in the most incredible shade of navy prussian blue. Remember that color from the old crayon box? It was always my favorite. We are back in our stateroom, watching the ocean slide by while Mo watches the news. We have FOX, BBC, and MSNBC to choose from, no CNN. But unlike European hotel coverage, this news is the same that is running in the states. Soon we will "dress" for dinner, and take the long comfortable walk to the back of the ship for our Thanksgiving turkey dinner. It is a formal night, and already we have seen some really gorgeous dresses, and spiffy tuxedos. I know some folks don't like this part, but for me it is fun. Dress up opportunities in Klamath Falls are rare, and my work life for several decades required heavy boots and dirty jeans. I love putting on long flowing things that sparkle and love even more watching all the other people who are sparkling. An easy day at sea, and I am feeling great. The sun has risen and I realize that we are on the right (oops, I mean correct) side of the ship for the trip toward the islands. 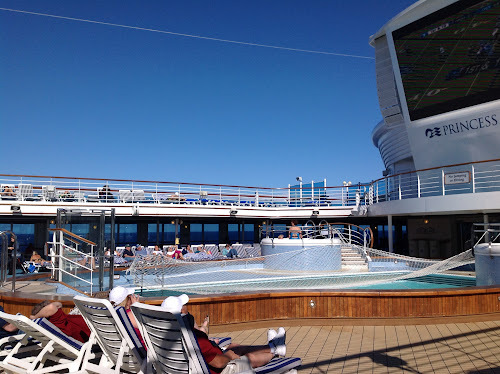 Our cabin on the Star Princess is on the port side of the Baja deck. We are in the forward part of deck, the eleventh, so there is a bit of movement here as our ship leaps through the moderate swells. 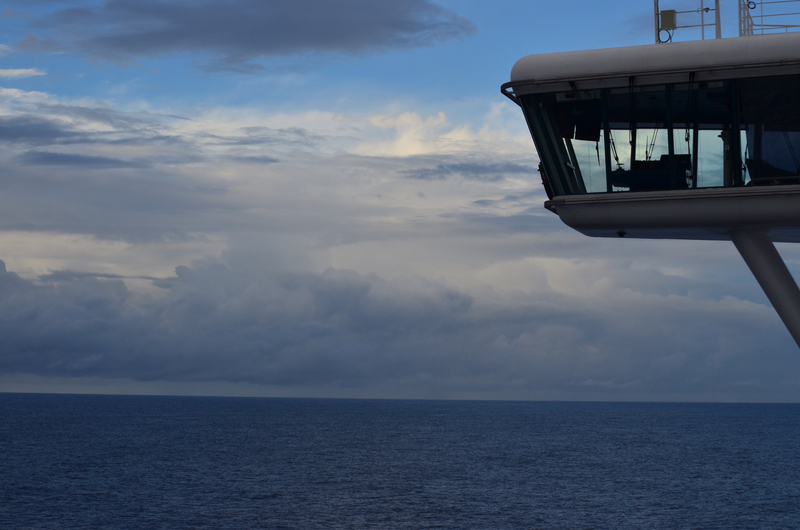 I woke several times during the night, rocking to the motion of the ship. I wondered if this is how it might feel to be a babe in your mother's womb. I am grateful for my sea wrist bands which are almost keeping me from feeling sick. I have scopolamine patches with me but I hate to use them since they make me feel so weird, but I think my plan is failing. We are waiting for morning coffee and pastries to be delivered to our cabin. 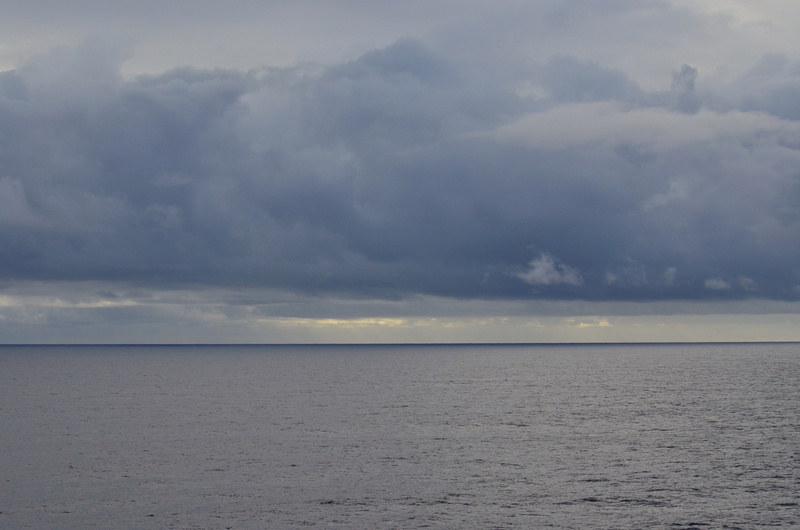 Our plans include just about nothing on this, our first day at sea. I guess that is a good thing since it is now several hours later and I am just emerging from a major bout with sea sickness. Lesson learned: if you wait too long before putting on the patch it will be too late. We began this trip with a nice drive to San Francisco, west coast departure was nice since we didn't have to fly anywhere. 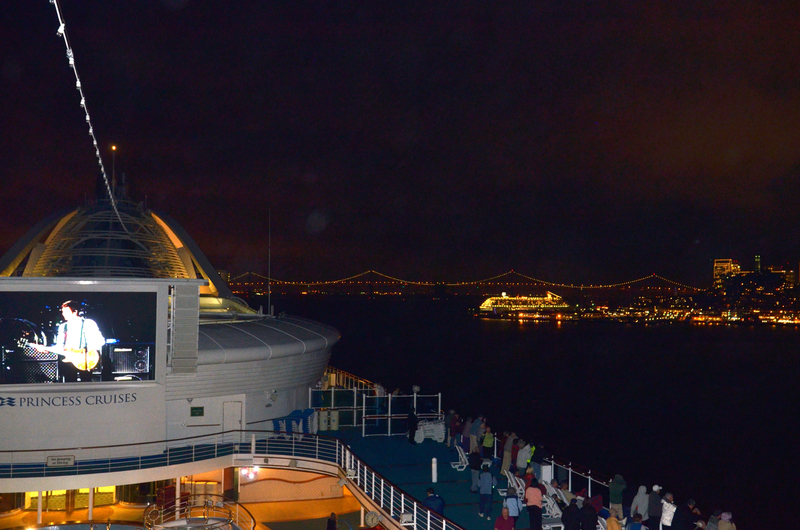 It took us just over seven hours to get to the City and Pier 35 where the beautiful Star Princess dominated the skyline. I am not yet jaded enough to keep from getting excited at these big ships. They truly are an amazing wonder of ship building and they are just getting bigger and more shiny all the time. The pier had a drop off area but the traffic on the Embarcadero was backed up and slow. We sat in line for awhile before deciding to just go park at the prearranged garage and walk with our bags. It was only a couple of blocks and very easy. Once inside, the lines were long but moved along quickly and efficiently and in no time at all we were in our stateroom. Our luggage was even delivered within a few minutes of our arrival. Our stateroom steward, Imman, from Indonesia, introduced himself, and very shortly we had the requested foam pad all set up. The Princess beds are very hard, so it is smart to ask for a pad before they are all gone. We unpacked, once again appreciating the incredibly roomy closets on Princess and the extra drawers and shelves that do so well accommodating all our stuff. 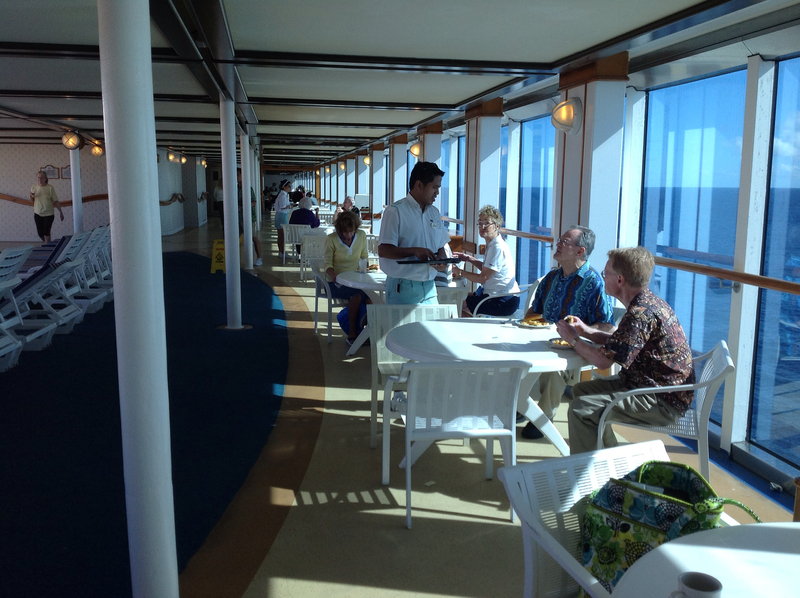 We walked upstairs to the Lido deck for a late lunch of fruit and Caesar salad. There are lots of fresh veggies available and the watermelon and pineapple were nice and sweet. 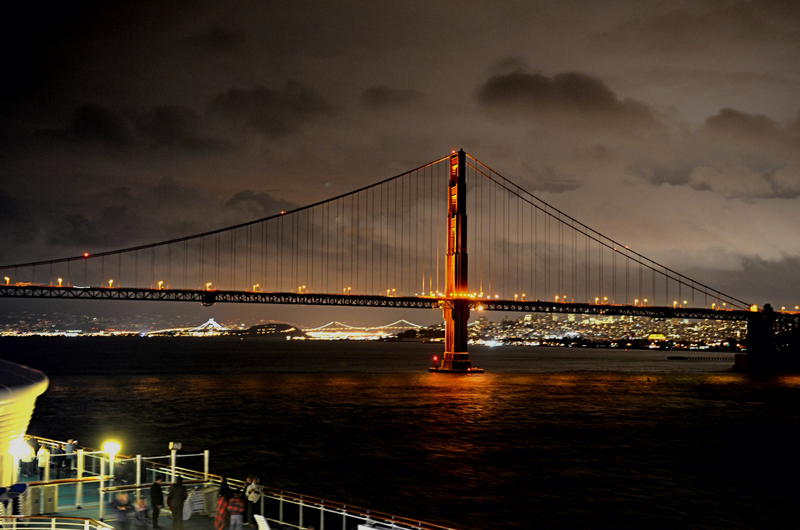 One of the things Mo wanted most from this San Francisco departure was the sail out under the bridge. 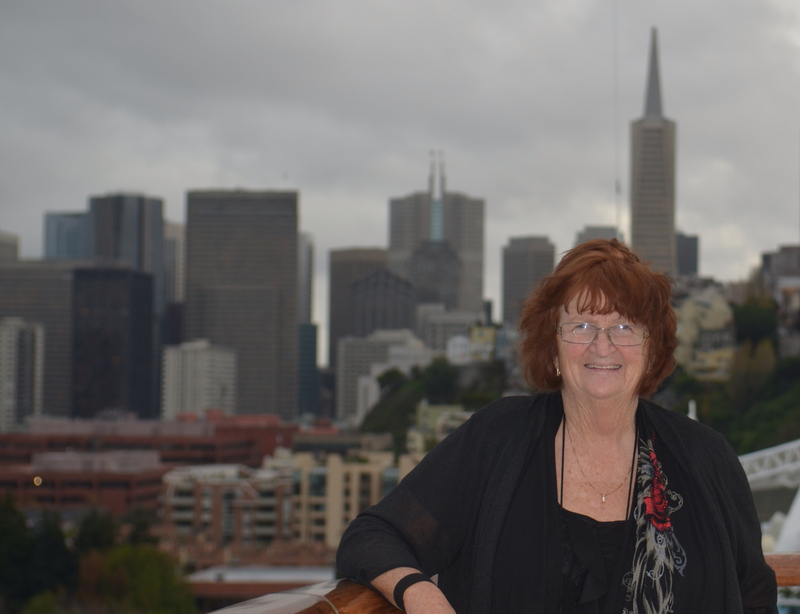 Having lived nearby in Montera for many years, she has a special relationship with the City. Our departure was scheduled for 4pm and in spite of the cloudy skies we knew there would be a great view of the bridge as we sailed beneath. We climbed to the top decks in the chilly air for the sailaway party, which ended long before the actual sailaway. With a two hour delay, we sailed in the dark, but it was still magical. Accompanied by Paul McCartny on the big screen and the lights of San Francisco, we sailed underneath the bridge in the dark drizzly skies, and raised our glasses and cheered with everyone else when we went under the bridge. Above us on the bridge, people were cheering as well. Before we knew it, it was time for dinner. We had chosen early seating and specifically requested a table for two. 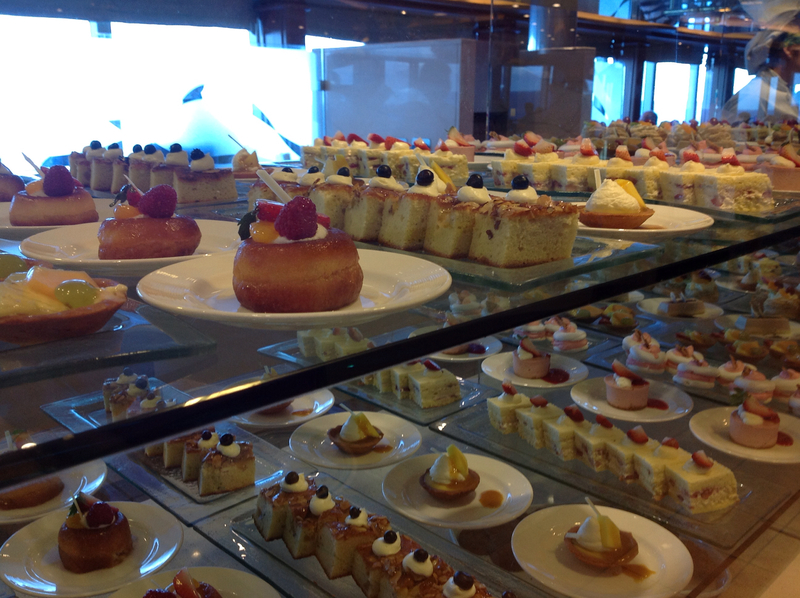 Of course, we were led to a table for eight and the waiter was insistent that two tops did not exist for early seating. After a bit of a wait in line, I conferred with the maitre d and we signed up for late seating and a table for two. I would rather eat late anyway when we are exploring, but it is hard to eat so late on sea days. Better than having to play nice. Of course, we could get delightful people, but in the past it has been rather tiresome. We enjoy each other's company without all that extra effort. It had been a long day and by 7 or so we were both running down and decided that a buffet in Horizon Court would be just fine. Nothing fancy. Some kind of pork cutlet with rice, our standard watermelon, salad, and topped off with a really good cup of coffee. The bed felt great after that and in spite of the rocking I slept great. Today has slipped by easily, especially after I quit being sick. A nice perk on this cruise is the $250 credit that Mo gets for being military. We can have a drink a day each and just barely use it up. The extra helped us to decide on a night at the special steak house some time during the trip. The swells coming from the northwest are huge and the ship is still rocking crazily. Don't let anyone tell you there isn't much movement in a big ship! Tonight we are going to the dining room for dinner. Just a little side note. This afternoon I took the iPad down to the Internet cafe and discovered another good reason for not upgrading to iOS 6. It isn't compatible with the ship satellite Internet system. Lucky me and unlucky for a lot of folks standing there with ther shiny new iPads.